Hmmm, I really want to get the cheaper version of this watch because I actually wanted this for Christmas but the MK ones are kind of expensive! oh my gad. those are beautiful! Again. Thank God for Shock Boutique. I love that they have this. This is so cool. Beautiful watch. I did find my self a sightly cheap cheap cheap version of this. You have been inspiring. Its really a far cry from Shock boutique, but I get compliments on it. & I have the time now without looking on my cell. Realistically, I'd probably splurge on the brand name ones (I like good watches). But the cheaper one is a dead ringer! Nice find (as always), Erika! I love the Shock Boutique version. Nothing gets me more like tortoise and gold. Hope you're having a good Sunday, E. Happy Holidays. Fashionista.com has a column called "Adventures in copyright." YOU WOULD TOTALLY ROCK IT. These look the exact same. And quite frankly, I can't spend $250 on a watch! I love the tortoise watch. The shock boutique looks awesome! The Shock one is gorgeous! Another amazing affordable find, darling E! woah they look quite the same !! i actually like the bronze version better ! The Shock one is super cute but I have to say that no one can beat M.Kors on watches! HA! My boss just bought a Micheal Kors watch for his girlfriend for xmas! But the Shock Boutique one is super cute too! The watches wood bee fine with me xcept I don't like the coloring of the bands. Btw, how's the weather in your area? Love the retro vibe of these watches! I'd probably go for the steal since they look so similar and I have too many watches already! I must say, I would have went for the cheapest one:D They are so similar that it's hard to tell the difference! I spent all of my money on gifts, but i managed to squeeze in a fake mongolian sheep fur from Ebay:) Have an amazing evening! They both look awesome, it's like a watch and a bracelet all in one! 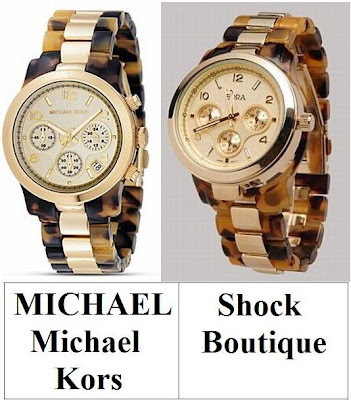 I do love the Michael Kors one better, but the other who looks just alike for that price? Consider me safe and thrifty. I would totally splurge on this. I normally don't wear watches, but I like the look of these! I love the subtly menswear vibe of them. This is just so cool. I'm so glad you found this. Love it from Shock Boutique. Oh I absolutely adore this find! So perfect, and I need a new watch! I own 8 different watches! My husband bought me the Fossil Boyfriend watch for Christmas a couple years ago and I have forsaken all others. It would be folly for me to purchase either of these as I am stuck on my Fossil watch but if I HAD to choose one> I would go with the MK. I always splurge on watches! I love the Micheal Kors one. It looks stunning. I absolutely love this design of watch, I would go with the Kors thoughas I like the quality and a watch is always an investment. 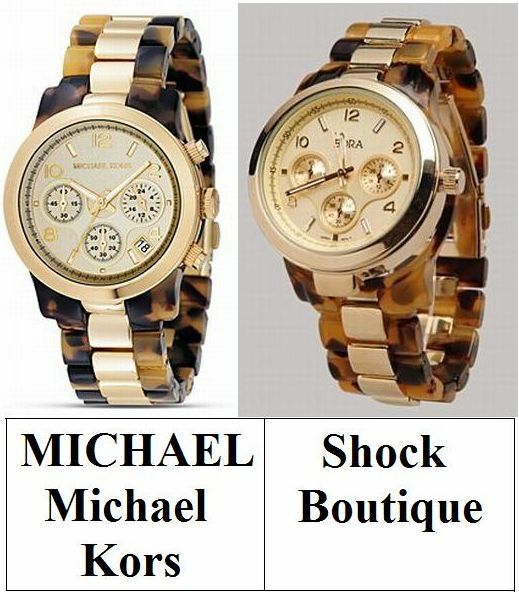 I absolutely LOVE my Michael Kors watches so I can't pass up a watch by MK! They're perfect!! I love Michael by MK! I actually would like the one to the right- but i would even more like a watch like that- just in gold..